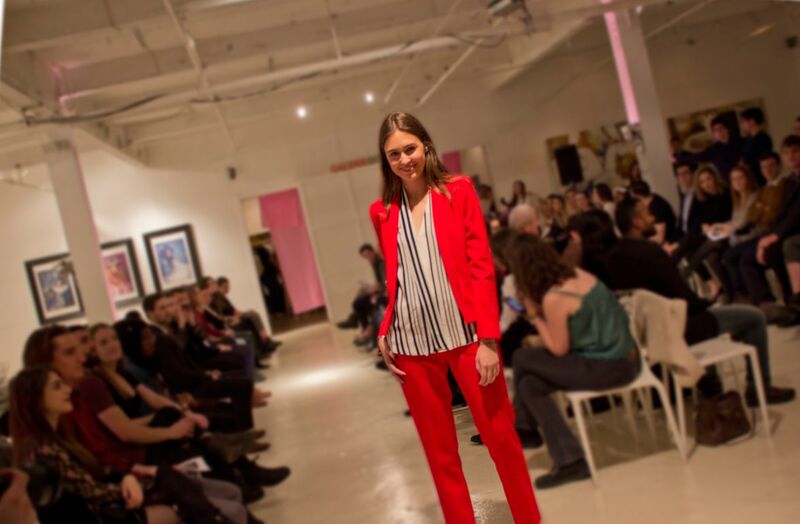 On Jan. 19, Gallery Gora, situated on bustling Sherbrooke Street West, was transformed into the set for the annual McGill Law Fashion Show, complete with hanging neon art to compliment a stylish white-concrete floor. With diverse colours, designs, and styles on display, the fashion show, both run by and featuring McGill Faculty of Law students as models, buzzed with energy throughout the night. Proceeds from the show went to Dreams Take Flight, a program that pays for children with mental and physical disabilities or structural disadvantages from across Canada to fly to Disney World for a day. The show served as a window into the local fashion industry, with models donning a diversity of styles from the Montreal design scene. The event showcased 10 designers, including Dominique Ouzilleau, an artist who experiments with colour and texture in furs. Each Ouzilleau piece seemed to be a mosaic of shapes made entirely of fur in varying shades and thicknesses, rippling down the runway with mesmerizing effect. The event also showcased Judith and Charles, a local brand tailored to women. The pieces made heavy use of vertical lines and contrasting colours, with pieces of fabric held together neatly and with tight control. Many of the evening’s models were first-timers in the craft, but noted feeling comfortable nonetheless. To Gabrielle Landry, first-year Law student and model in the show, the importance of raising money for children in need and the ability to creatively work together with other law students took center stage over pressure to be perfect. The show’s welcoming atmosphere extended to attendees as well, attracting a wide range of students across McGill.